Submitted by keenan on Thu, 2008-03-06 19:24. 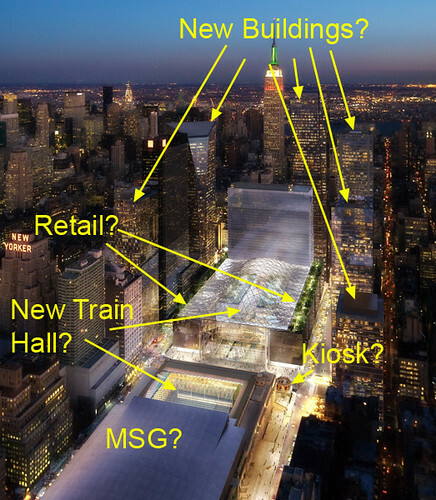 ”I mean really, why does MSG need to move? Couldn't we achieve the same amount of train hall space in the gorgeous post office building without having to build a new architecturally dated glass monstrosity? 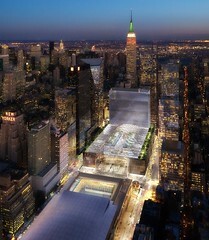 And furthermore sticking an arena dome on top of the post office is going to be a horrendous architectural foul. If they must put MSG in the post office isn't there someway to make the addition blend into the current building?I do not like one single part of this plan." Submitted by keenan on Wed, 2008-03-05 15:19. The Friends of Moynihan Station (MAS is co-chair) released the first rendering of Moynihan East a few days ago, apparently received from the ESDC (although it’s not to be found on the ESDC web site). While it’s a relief to finally see a rendering, it also raises some questions. 1. Does this plan illustrate the 1.1 million s.f. of retail on the Moynihan East block? 2. There seem to be six new buildings in the rendering. Is this all the 4.5 million square feet of development rights? If not, were will the rest go? 4. What is the property ownership structure for this plan? Have some privately owned properties been acquired? Click here to see a map on property ownership that we made. 5. Is that a big round kiosk on the corner of 31st Street and Eighth Avenue? What do you think about these plans? Do you have any questions? When do you think will we get to see the detailed plans? Submitted by keenan on Fri, 2008-01-11 15:23. To wrap up retail week, we’re posting a brief video from a recent MAS panel on retail diversity. On Wednesday, Michael Ewing described how he worked with the MTA to bring local NY retailers into Grand Central, which contributed to its revitalization during the 1990s. A few of the local retailers eventually became chains of their own. 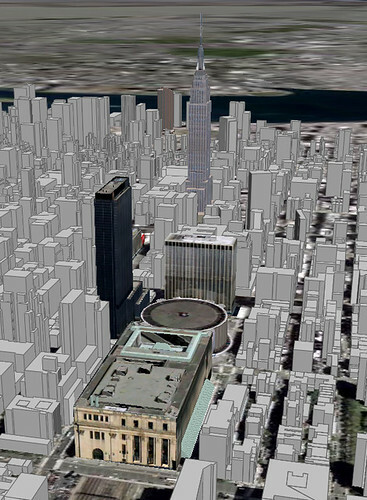 The case of Grand Central is interesting in light of the retail plans for Moynihan Station. After all, the Draft Scope for the project describes a retail development of 1.1 million SF on the current site of Madison Square Garden and future site of Moynihan East. That's about nine times the size of the retail in Grand Central. We're concerned that too much mall will prevent the development of a monumental and spacious new train station and the lack of detailed plans for the station certainly raises a lot of questions. Will we see a mix of local/chain similar to Grand Central? How much big-box will it include? Will it allow for a railway station that works? Why is the number of chains increasing in New York? What is the impact of chain stores on a community? How can we improve retail diversity? The panel included Vicki Weiner of the Pratt Center for Community Development, Michael Ewing of Williams Jackson Ewing, John Shapiro of Phillips Preiss Shapiro Associates, and Michael Berne of MJB Consulting. Submitted by keenan on Wed, 2008-01-09 18:06. Michael Ewing is principle of Williams Jackson Ewing, a retail real estate development, leasing, and consulting firm based in Baltimore, and developer of the tremendously successful restorations of Grand Central Terminal and Union Station in Washington, D.C. 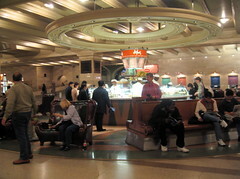 In 1994, Williams Jackson Ewing and LaSalle Partners were awarded the rights to redevelop Grand Central Terminal. Williams Jackson Ewing conceptualized, merchandised, leased and opened 119 stores and restaurants, which include a mix of local New York favorites and popular chains. 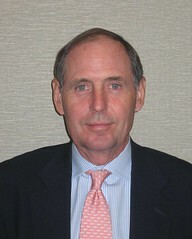 Prior to becoming partner at WJE, he was Vice President at The Rouse Company from 1972-1985. 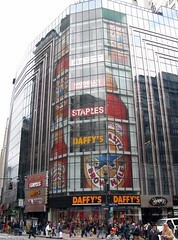 Ewing is widely recognized as a thought leader on urban retail development trends. He talked to New Penn Station about the retail plan at Grand Central, making public/private partnerships work, and the retail potential of Moynihan Station ("a lot of retail," but could work). Submitted by keenan on Mon, 2008-01-07 11:47. The Moynihan Station project proposes 1.1-million-square-feet of retail development (see p. 19 of the Draft Scope) for Moynihan East, the new train station that will rise on the current site of Madison Square Garden. Retail development has contributed to the revitalizations of Grand Central Terminal (right), Union Station in Washington, South Station in Boston, and other great train stations throughout the world. Everyone agrees that retail can add liveliness to a station, but is 1.1-million-square-feet too much? The fact is 1.1 million is a larger square footage than Madison Square Garden itself, which smothers the current Penn Station. We think it’s reasonable to ask whether an even bigger development will provide enough physical space for an iconic, day-lit, and spacious station to grow. In order to ensure adequate space and to limit major train disruptions during construction, the MAS has recommended allowing the transfer of more development rights to the Moynihan Station subdistrict as an alternative (see p. 10). 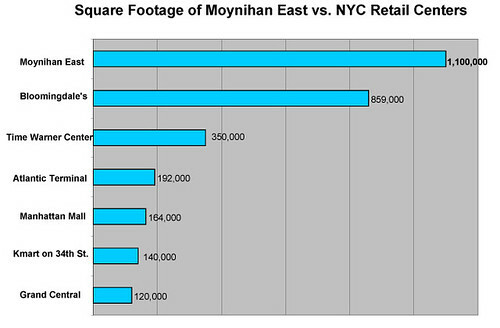 We'd rather see some of the development sprinkled throughout the district than concentrated on Moynihan East. We’ll be posting several items about retail in train stations throughout the week. How much and what type of retail would you like to see? Comments are welcome.